The F Series offers class leading speed, precision and ease of integration. All units are built to comply with ANSI/RIA/ISO 10218-1-2007 safety standards and are available in CE models for global acceptance. A long list of standard features makes this series a perfect choice for applications across many industries. 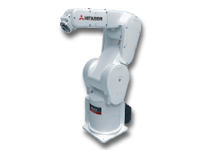 SCARA type robots are available in ISO3 clean room and mistproof versions. Payloads range from 3Kg to 20Kg with 350mm to 1000mm reaches. Vertically Articulated type robots are available in ISO3 clean room and mist-proof versions. Payloads range from 2KG to 70KG with 504mm to 2050mm reaches. 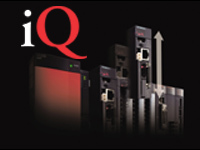 The iQ Platform unifies all of the Mitsubishi Electric automation disciplines into a one-of-a-kind modular Programmable Automation Controller (PAC). The iQ Platform is the only PAC capable of integrating individual Sequence, Motion, CNC, and Robot control onto a single back-plane rack. Based on the multi-CPU architecture of the renowned Q Series Automation Platform, the key to this multi-discipline functionality is the CPU-only data bus on all Q3*DB base units. This secondary bus facilitates a large high-speed shared memory area between up to 4 CPUs, each controlling different aspects of the automation system. Each CPU then shares its working data at an almost instantaneous refresh rate between all CPUs in the configuration. This design makes the iQ Platform ideal for multi-discipline systems.